It’s very hard to mess up the styling of a mid-engine sports car. The mechanical layout, very desirable to serious racers, allows excellent proportions for a two-seater, and it just seems emotionally desirable to most of us. 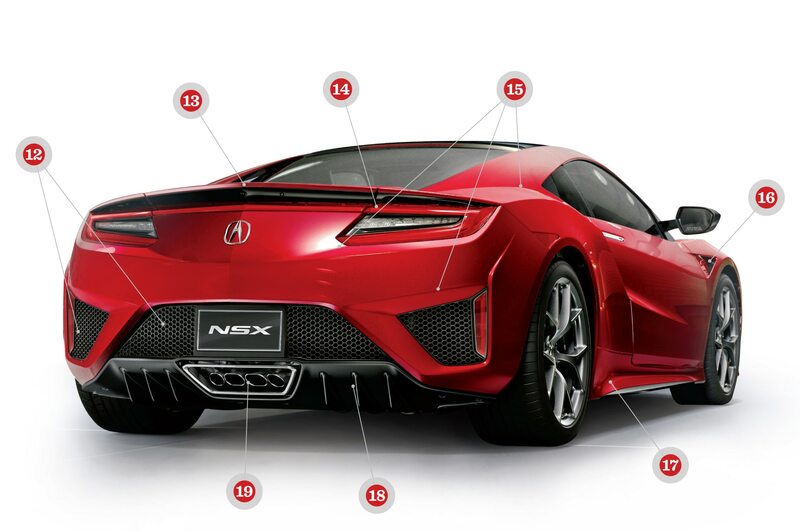 So, yes, it’s very hard to screw up, but Acura has managed it. 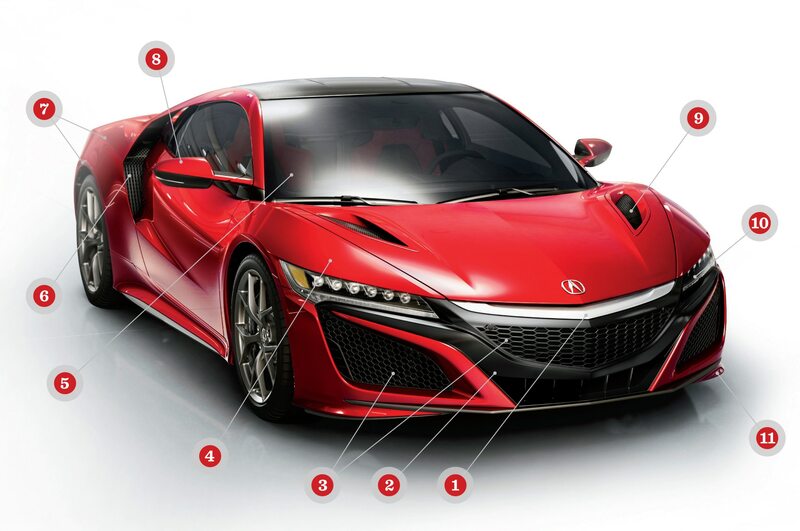 Acura’s parent, Honda, has been offering really fine mid-engine road cars intermittently since 1990, in both the previous NSX and the petit Beat roadster. They’ve been less than world leaders in styling but nonetheless had amazing appeal and caused fervent pleas for successors. 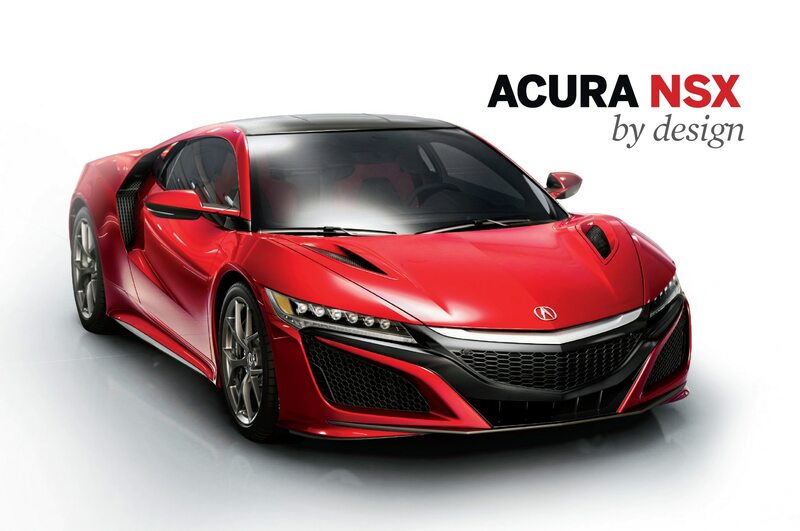 The new 2016 Acura NSX has had a public gestation period to rival that of the current Chevrolet Camaro, which had been seen time and again at auto shows with constant promises of “real soon now.” See Alfa Romeo for further confirmation of this weak marketing tactic. Also see Alfa Romeo for proof that you can do a mid-engine sports coupe bearing visual links to a brand’s past and strong marks of identity, neither of which are present in the new NSX. Who has ever asked for a fat chrome bar across the nose of a sports car? Why in the world would you stick three grilles and a chin scoop on the nose of a sports car, especially if the biggest, shiniest, and most prominent one is a complete fake, a solid barrier shield with merely a few tiny holes on the bottom row that air can pass through? Why injection-mold plastic to simulate a woven-wire grille texture like a ’20s Bentley? And if glossy black is the right finish for a simulated stone guard, why not use that finish on the other two grilles defacing the front surface of the car? the intent of its creators. 1. This clumsy chunk might be an Acura brand-identity cue, but it’s vulgar and overdone on every Acura, even SUVs, and completely inappropriate on a car of this nature. 2. This heavy black band twisting across the front blocks some incoming air. Altogether, the front looks more electric shaver than supercar. 3. The disparate textures of the center and corner grilles could be justified if they were purchased off rolls at a farm-supply store, but if they are concocted, why not make them consistent? 4. This simple planar surface joining the fender peak and headlamps slot is elegant and flows nicely but is interrupted ahead of the doors by more supposed air outlets. 5. The windshield is admirable, large for good visibility, subtly curved in all directions, and unadorned with extraneous trim. The entire upper body is very nicely executed. 6. More grilles, more alternative texture. The side scoop should provide enough flow to flush the engine compartment of excess heat. 7. Ribbons of slightly curved but nearly flat material define the upper and side portions of the rear fenders. 8. The mirrors are necessarily carried well outboard of the cockpit so the driver can see past the wide rear fenders, their volume reduced by using two colors. 9. Too much visual importance is given to these grilles, which are framed by large inset moldings. 10. Twelve headlamps seem a bit too show-car fussy for a production vehicle. One hopes they light the road well. 11. These blips recall air deflectors on Chaparrals some four decades back. 12. There is still an excess of grille area on the back, but the three segments are blessedly consistent. They share texture and surface finish, unlike up front. 13. The slightly pointed tail is emphasized by the nicely modeled spoiler. The rear is cleaner and simpler than the front, but not by much. 14. The taillights are simple, direct expressions, set slightly into the surface of the tail, with sharp points at the upper outer edge and the lower inner corners. 15. There are a number of sharp intersections between discrete surfaces, especially from the flying-buttress C-pillars and the fender top. 16. this little grille does nothing for the overall composition. If functionally necessary, it could be less obtrusive. 17. This linear indentation creates a rising line in the side profile that suggests a wedge shape, which is not, in fact, present in this design. 18. Is this very racy-looking diffuser actually wind-tunnel-developed for downforce or just a clever cosmetic styling effect? It looks convincingly real. 19. Multiple exhaust pipes have two shapes: round outers and rounded-rectangle inners. One wonders why. And why frame them in a rounded trapezoid? 20. The steering wheel is disappointing. It’s very sedan-like in aspect, and there’s too much bright (if dulled) metal trim. 21. I have the same reaction to this door pull. It’s an excellent idea with a good shape, but it has an inappropriate finish. 22. Red stitching only at the top of the wheel is a subtle touch. 23. The pointed center portion of the dash comes across as a scale-model Pontiac front end. The positioning of the warning switch, however, is very good: high and visible. 24. More of the excessive dulled-metal finish with a tortured shape. I expect something with more clarity of purpose in a sports car. 25. Like these excellent cubby holes in the door panels. Simple, direct, functional. And therefore good. Was previously supposed to go on sale in fall 2015. Racer expected to launch in 2017.